The Simpson DR2 or Devil Ray 2 auto racing helmet is a modi?ed version of the Devil Ray helmet, homologated to Snell SA2015 certi?cation with loads of new features including a new clear air pipe for top air, or a side air offset. The Simpson DR2 model comes ready for electronics and air supply. The air options can be added without drilling holes into the helmet which allows the customer to try different options without the worry of destroying a helmet. The Simpson DR2 model offers improved comfort and fit while maintaining the level of quality found in the Simpson Devil Ray helmet. The Simpson DR2 or Devil Ray 2 auto racing helmet is a modi?ed version of the Devil Ray helmet, homologated to Snell SA2015 certi?cation with loads of new features including a new clear air pipe for top air, or a side air offset. The Simpson DR2 model comes ready for electronics and air supply. The air options can be added without drilling holes into the helmet which allows the customer to try different options without the worry of destroying a helmet. The Simpson DR2 model offers improved comfort and fit while maintaining the level of quality found in the Simpson Devil Ray helmet. Ventilation was added to the Simpson DR2 model in order to let heat escape and keep the driver comfortable. Non-integrated accessories can be purchased and installed by the customer or at the factory. New clear air pipe for top air available. Side and offset air available. Pit Stop USA offers Simpson DR2 Auto Racing Helmets at low everyday prices. 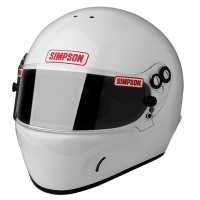 Be sure to check out all our products from Simpson Performance Products including Simpson Auto Racing Helmets.